Why You Should Consider Mat Rental For Your Gym | Ace Uniform Services, Inc.
Every gym should consider a mat rental service. 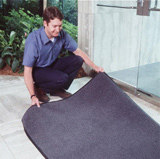 Floor mats are a simple addition to any home or business facility but serve a huge purpose. Not only do they help keep dirt from coming in, but they also prevent injuries and can great for branding efforts. If you are a gym owner, you would be wise to invest in a mat rental for your business for the following reasons. Gyms are not exactly the cleanest facilities around. There are always people are dripping in sweat and for whatever reason, manners seem to apply less in gyms. If you are trying to keep a clean gym, a mat rental service is a great investment. You should always have floor mats at every entryway because they are high traffic areas in which people are bringing in dirt and mud on the soles of their tennis shoes. There should also be floor mats in the bathrooms/locker rooms so people are not leaving trails of water everywhere from the pool, showers or hot tubs. Water that is left on the ground can lead to the growth of bacteria. Floor mats are an easy solution this problem. If you own a gym, you know how competitive the industry is. You are competing against the other gyms in your area and are constantly battling for more customers. A custom gym mat could give you a great advantage over your competitors. Try to imagine this: a nice big welcome mat outside your front door that features your gym’s logo. As people walk by, they will be enticed to walk up to it. In addition, you put more of these inside your facility which could improve the look and atmosphere of your gym. This entry was posted on Monday, July 17th, 2017	at 9:56 am	. You can follow any responses to this entry through the RSS 2.0	feed. Both comments and pings are currently closed.